'Miles Ahead' brings us yet another biographical drama however one we have never seen before. Also how many people in their directorial debut will also be the lead and portraying an iconic figure in music? Well that's exactly what Don Cheadle did which is a very brave move. Fortunately for him, he was able to pull both off. Cheadle brings great character and commands the film, stealing the limelight in every scene with his unpredictable and reckless ways. In his directing debut, Cheadle does a great job at combining responsibilities whilst creating an interesting lead who demands your attention in every scene. 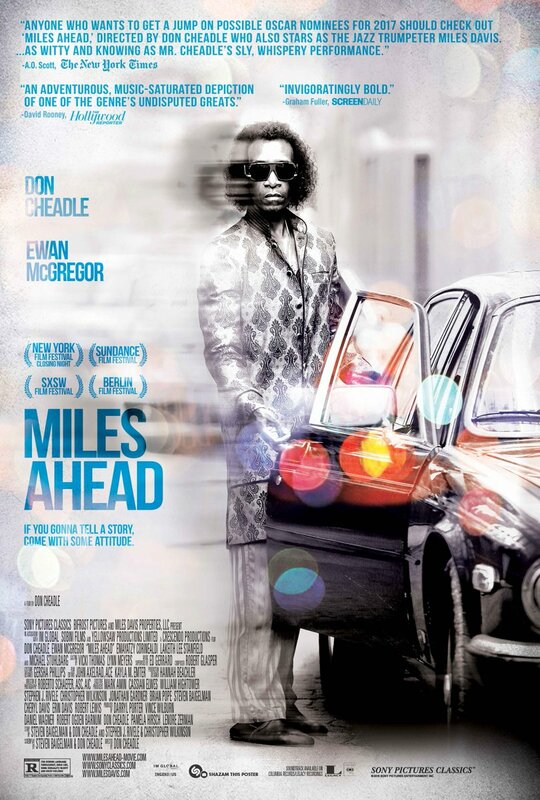 Well every scene in the storyline surrounding Miles Davis (Cheadle) and journalist Dave Brill (Ewan McGregor). The film is split into two sections that take turns in telling their stories. One follows Davis and Brill coming together to talk about Davis' potential comeback, leading to a stolen tape which leads to the unlikely duo becoming partners trying to get the stolen record back whilst in the face of danger. The other follows Davis' love life with Frances Taylor (Emayatzy Corinealdi). Clearly one of these has much more excitement and with that comes the more interesting part of the story. The problem with having quite a difference in tone, with one being high octane and the other not so much, it makes you want to go back to the more entertaining aspect whenever it switches. It is safe to say that the aspect of Davis' life after his fame and leading to a return is the more interesting part and will keep your eyes glued to the screen. There is a lot of fast paced action throughout the film which wasn't really what I expected from this. However it adds to the craziness of Davis and shows how reckless he was in order to get his tape back. He will do anything to get it back, even threatening death to those who stand in his way. This leads to some very entertaining scenes where Cheadle and McGregor play off each other very well. However the film suffers as it switches as the aspect of Davis' love life doesn't grab the audiences attention. We get a look at Davis' controlling ways and due to this, it is hard to think why they should be together which in the end makes the audience lack sympathy towards Davis. Along with this, it really isn't as interesting and the audience isn't as invested as before. This most definitely slows the film down and doesn't really improve the story. It adds to Davis' life for those who didn't know of him but that's it really. The switches being the two stories is done very fluently and also very creatively. The film uses some very cool looking switches where something will happen in one aspect in the story and the result will end up being in the second part allowing thee film to move on instantly. Quite impressive and a bold risk for Cheadle to take in his directorial debut but fortunately for him, it worked. In a movie based on one of the great musicians, you would expect the film to contain some great music. That is most definitely the case within 'Miles Ahead' and this is more than evident in the finale where Davis is back playing and you don't want it to ever end. A great end to the film where we see one of the greats being brought back to life one last time. A fairly good attempt from Don Cheadle as he combines directing and acting. However the split of the two stories does make the film suffer at times. Worth checking out though! 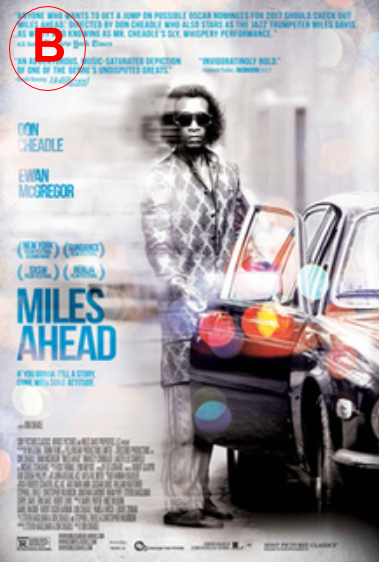 So have you seen 'Miles Ahead'? If so what did you think of it? Once again thank you for reading this review, it is much appreciated!